Resiliency is the ability to recover from or adjust easily to adverse events. It is a critical trait for individuals working in high-risk environments such as healthcare. Resiliency can be fostered through the development of skills that allow individuals to effectively identify, cope with, and recover from challenging experiences. RDoC has focused on the development of a Resiliency Curriculum that is national in scope, drawing from the highly successful Road to Mental Readiness (R2MR) program created and implemented by the Canadian Armed Forces and The Working Mind program taught by the Mental Health Commission of Canada (MHCC). RDoC’s Resiliency Curriculum is practical, skills-based, and designed to help mitigate stress and optimize performance. It is instrumental in helping residents overcome both the anticipated and the unexpected adversities of medical training. The Resiliency Curriculum promotes the importance of mental resiliency in physicians by fostering supportive learning environments and advocating for a systematic approach to understanding and addressing stressors. Resiliency training prepares residents to transition to rewarding, and sustainable careers − which yields benefits for patients and Canada’s healthcare system as a whole. The main component of RDoC’s Resiliency Curriculum is the Resident Module, a 3-hour interactive workshop facilitated by RDoC’s resiliency peer trainers. RDoC has also created a Leadership Module intended for anyone in the postgraduate medical education environment who wishes to champion resident resiliency and well-being. 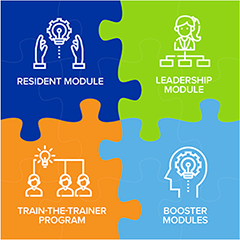 The Train-the-Trainer program was developed to recruit resident volunteers across Canada who will deliver these modules to their peers and colleagues. A variety of booster modules will supplement the core resiliency training. If you’re interested in becoming a resiliency peer trainer, hosting a workshop for your program, or if you’d like any other information – please contact us at resiliency@residentdoctors.ca.